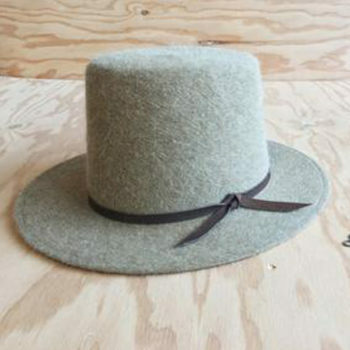 Fedora Hat in olive green rabbit fur felt with two-tone ochre grosgrain band, dark and light olive green lambskin trim. Light olive green tassel. Brim width: 2 7/8” Check your size first! Click Here. Fedora Hat in black rabbit fur felt with two-tone pink grosgrain band, black lamb and cow skin trim. Black suede tassel. Brim width: 2 7/8” Check your size first! Click Here. Mist grey rabbit fur felt telescope crown hat with grosgrain band and bow, lambskin trim. Handmade straw feather trim. Brim size: 3 1/2” Check your size first! Click Here. Antique Pink rabbit fur felt telescope crown hat with grosgrain band and bow, lambskin trim. Handmade straw feather trim. Brim size: 3 1/2” Check your size first! Click Here. Natural straw panama hat woven by hand with Colombian toquilla straw, trimmed with with black and light grey grosgrain bands, and black lambskin trim. 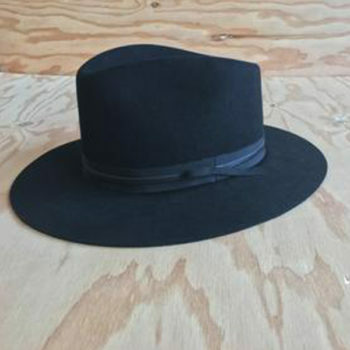 Black lambskin trim around brim edge. Brim size: 3 1/2” Check your size first! Click Here. Brown panama hat woven by hand with Colombian toquilla straw, trimmed with royal blue and light blue grosgrain bands, and navy blue lambskin trim. Navy blue lambskin trim around brim edge. Brim size: 3 1/2” Check your size first! Click Here. Navy blue long hair rabbit fur felt with Italian wool bias band, light blue silk, and navy blue lambskin trim. Brim size: 2 1/2” Crown height: 5 1/2” Check your size first! Click Here. Camel long hair rabbit fur felt with Italian wool bias band, plum silk and treated olive green lambskin trim. Brim size: 2 1/2” Crown height: 5 1/2” Check your size first! Click Here. 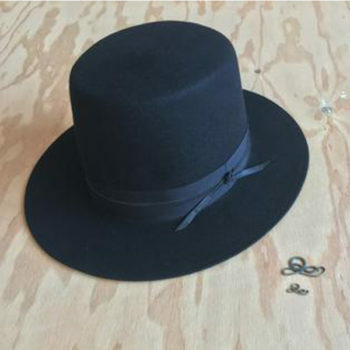 Tone on tone Fedora Hat in black rabbit fur felt with black cotton-rayon grosgrain band and black lambskin trim. Brim width: 2 7/8” Check your size first! Click Here. Camel long hair rabbit fur felt with brown pigskin trim. Brim size: 2 1/2” Crown height: 5 1/2” Check your size first! Click Here. Tone on tone black rabbit fur felt with a black grosgrain band and black lambskin trim. Brim size: 2 1/2” Crown height: 5 1/2” Check your size first! Click Here.